The invention proposes to guide a robot by projecting a laser light, image processing and communication to improve the accuracy of guidance. The invention spans areas of robotics, computer vision, user interface, video games, communication and smart home technologies. The key idea is to show goal positions to a robot optically instead of communicating them numerically. This intuitive interface simplifies directing the robot while visual feedback improves the accuracy of guidance and allows for implicit localization. The guidance system serves also as a mediator for multiple robots, as shown in Figure below. You are welcome to read about this invention in my article "Optical guidance method for robots capable of vision and communication" in Robotics and Autonomous Systems Journal: Link (reprint in PDF). A proof-of-concept experiment of directing a mobile robot by a laser pointer is shown on video at: Link (movie). Please view the patent summary outlining its key idea, advantages, market statistics, competitors and forecast: Link (leaflet in PDF). The patent may be of interest to Samsung Electronics, iRobot, Neato Robotics, Ecovacs and Google, as explained below. Samsung Electronics may have been using this technology in POWERbot™ robotic vacuum cleaners equipped with Point Cleaning™ since 2014: Link (movie) because Claims 1-5, 15-17, 33 and 34 of U.S. Patent 6,629,028 may be present in this product. According to Samsung.com Link , POWERbot™ with Point Cleaning™ can be purchased online in the USA ($999 in May 2015). POWERbot™ robotic vacuum cleaners have also been sold on Amazon.com since 2014. Samsung Electronics registered a trademark Point Cleaning with the U.S. Patent and Trademark Office on March 5, 2015: serial No. 86555014. 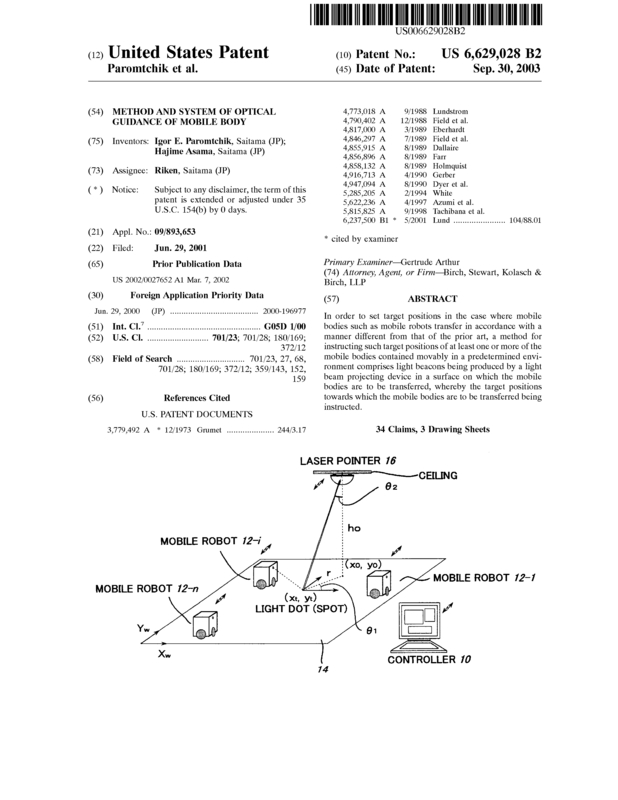 The previous patent applications by Samsung Electronics on robot guidance by laser pointer (Appl. No. 10/820,037, Pub. No. 2005/0027399 in the USA and Appl. No. 04250986.9, Pub. No. EP1515210 in Europe) did not result in patents because of the priority of my U.S. Patent 6,629,028 covering the subject. Samsung Electronics was granted U.S. Patent 9,675,229 on June 13, 2017 on optical guidance of a robot cleaner, with a reference to U.S. Patent 6,629,028. The similar patent application by Samsung Electronics in Europe (Appl. No. 15174995.9, Pub. No. EP2963515) has been under examination (European Search Report issued on Dec. 18, 2015). The robotic vacuum cleaners represent 23% of the global vacuum cleaners market of $7.5 billion with such competitors as: iRobot, Neato Robotics, Dyson, Ecovacs, Samsung Electronics, Moneual, Miele, LG Electronics. In 2017, iRobot shipped 3.698 million units globally and reported $884 million revenue with 34% YoY growth and 49% gross margin. There are 126 million households in the USA in 2016. iRobot’s $ share of U.S. robotic vacuum cleaners market is estimated at 85% with $452.3 million revenue reported in 2017 according to NPD and iRobot. Vacuum cleaner robots are forecast to grow rapidly from $981 million in 2013 to $2.6 billion by 2020 because of automated process and effective cleaning power (by ReportsnReports.com): Link . U.S. residential robotic vacuum market will grow at CAGR of 6.43% and 4.45% in terms of revenue and unit shipment, respectively, over the period 2014-2019 (by TechNavio): Link . Page created at 2019-04-26 17:49:01, Patent Auction Time.